You’re pumped! Several customer service initiatives that you developed have been very successful and you have the numbers to prove it. Satisfaction with your company has improved by a substantial margin and you’re ready to present this to some of the executive team. Your presentation is filled with charts showing the trend of improved customer satisfaction, and they’re eating it up! You think you are about to get a high-five from the executives…and then the CEO pops his head in. He glanced into the conference room and saw what you were presenting and he decided to sit down and see what this was all about. Does this sound familiar to you? Companies across the world are struggling with Customer Experience. Some know that they are struggling and others are oblivious. But they’re all feeling the symptoms of it: declining sales, high churn, unhappy or apathetic customers, low engagement or adoption rates or maybe even outright hostility toward your brand on social media. Having a consistently great customer experience are the best ways to turn all of those issues around. Want to not only keep your existing customers, but up-sell or cross-sell them as well? They’ll be much more willing to stick with and spend more money with you when they’re happy with the various ways they experience your brand. When asked in a survey what the most exciting opportunity for their business was, the number one response by companies was Customer Experience. They may be excited about it, but are probably clueless about how to take any action toward improving Customer Experience. 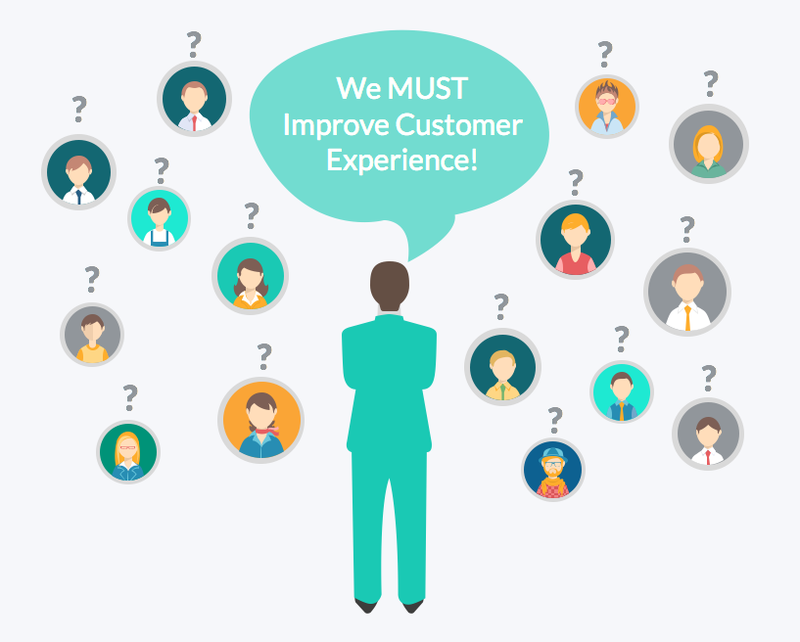 The fundamental reasons companies struggle with Customer Experience is due to a lack of understanding as to what Customer Experience actually means. Therefore there is no clear vision as to what makes a great experience for their customers. The pattern from the story is typical: someone in management hears the buzzword “Customer Experience” and issues a proclamation for the company to focus on improving it. They may or may not know themselves what it means and meanwhile, the employees are left to figure it out for themselves. The results always end up the same: individual programs that may have some positive impact, but they are typically done ad-hoc and in a departmental silo, not communicating what they’re doing to each other. This approach misses out on the company-wide cultural synergy of having a clearly defined Customer Experience vision for the company as a whole. For music lovers out there, think of it like this: Customer Experience is like trying to play a piece of music, and your employees are the musicians. 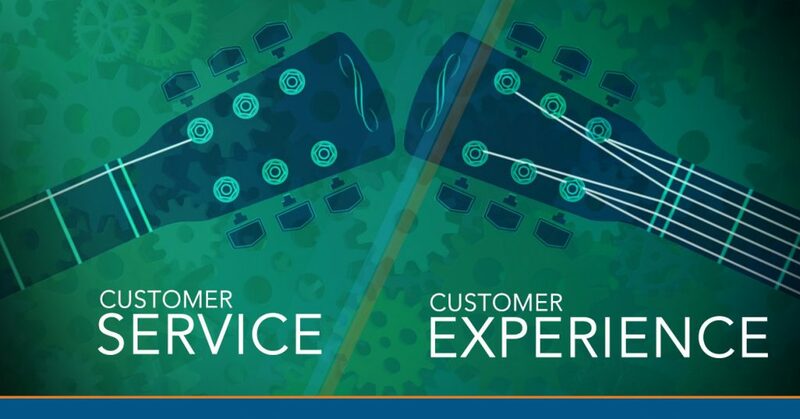 A clear Customer Experience vision is the sheet music, and without it your orchestra of employees is just making noise. Let’s try a little Customer Experience exercise using Southwest Airlines as an illustration. Have you seen any recent Southwest commercials? They’re personable and fun, and it shows that they enjoy their work and are having a good time. While they’re tugging on your sense of fun, the commercial is also selling you a value proposition. They’re presenting a persona of helpful service and, depending on which commercial, low cost fare, bags fly free, no hassle rewards redemption, or new tropical locations they service. Next we’ll move on interacting with their employees and their product, flying on a plane. If you’ve never flown Southwest before, you may be in for a shock, it’s a stark contrast to traveling with other airlines. Southwest actually does everything in their power to make getting from one destination to another as straight forward and pleasant as possible. The Bags Fly Free, they don’t charge you a fee for having to change flights, or sneak in other fees. When you’re on the plane, you’ll often be treated to the pre-flight safety demonstrations transformed into a short stand-up comedy routine. Even the planes themselves are a reflection of Southwest’s personality – they’re boldly painted in Southwest’s blue, red, and gold; no boring white planes for them. So, what can we say about Southwest as a company based on the experiences we’ve had with them? They like having fun, and want you to have fun with them. They want you to genuinely enjoy air travel. They are up-front and transparent about their prices. They’re committed to helping you get to your destination, even if you miss your flight or it gets canceled. Without having been privy to any internal Southwest strategy meetings, you can probably bet that those things above are core values to their company culture. They make up the foundation and vision for Southwest’s Customer Experience and how they differentiate themselves from competitors. Southwest’s CEO Gary Kelly has said “Southwest is a great place to work and brings the greatest joy because we have such meaningful purpose.” Southwest isn’t making noise; they’re making great music. 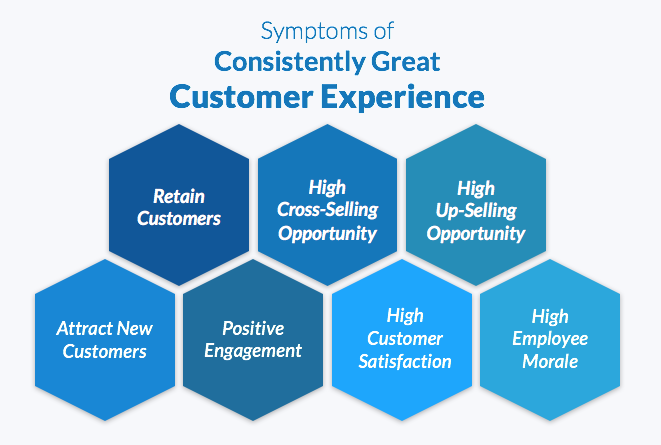 Customer Experience is, quite literally, how customers experience your company, and it is composed of all interactions a customer may have with your company, be it marketing, PR, sales, customer service, etc. Any possible way a customer or prospective customer may interact with your company and its products and services makes up your company’s Customer Experience. A clearly defined and well executed vision for great Customer Experience is the best way to differentiate yourself from competitors. If your CEO or some executive just proclaimed that “we MUST improve our Customer Experience” then first work on looking at your company’s core values and defining a high-level strategy for how you want your customers to experience your company. 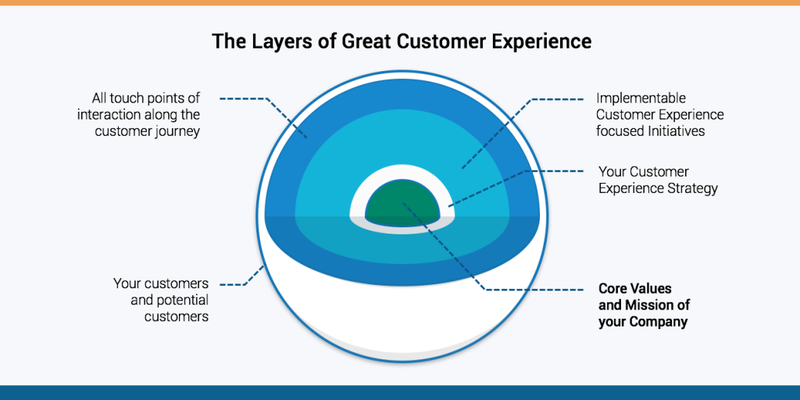 There are several layers to having great Customer Experience, and your your company’s core values are at the center. Or, thinking back to our musical metaphor: write the music for your orchestra and equip them with their instruments before you ask them to play. Identify who your customers are. Create definable customer types or personas. Start with a few and do them well while defining your process. Then extrapolate that process out to identifying the rest. Empathize with your customers. Step into the shoes of their personas you’ve created and try to think like they do. What do they find valuable, what do they identify with, what tugs on their emotional strings. Identify all the touch points your customers may have with your company and map out their journey along every touchpoint. Create value for your customers along the journey. This is the most important consideration – always be answering the value proposition for your customer along the way. This is what will convert prospects into customers and drive loyalty. It takes time and commitment to create implementable business initiatives that span across departments or divisions with trackable metrics around improving Customer Experience, but it is well worth every ounce of energy. These initiatives may involve a new marketing message, new communication plans, new employee on-boarding training, new customer service protocols, new technology initiatives – the possibilities are endless. But the key thing to remember is that true success with having great Customer Experience comes from having a company culture around providing your customers with great experiences. And that culture requires a vision. Customer Experience is every employees’ responsibility, but without that clear vision for what it is, your results as a whole will never be what your company desires for its customers. Think of that orchestra trying to play together without sheet music, or maybe even one musician trying to play a chord with just one string. Something will happen. It may even sound nice individually. But it isn’t the music that you wanted to create. Great music takes vision and coordination of many moving pieces; it is the same with Customer Experience.